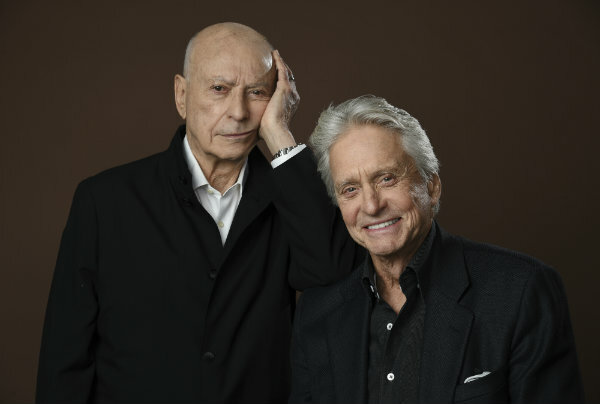 Arkin got the ball rolling when the pair was asked if they knew each other before making the Netflix series, a dramedy about the longtime friendship of an actor and his agent and the indignities of aging. "No. A few weeks before we started the show, I insisted on having lunch with him. He refused about 55 times. He finally agreed," a deadpan Arkin said. "I like to keep it fresh," replied Douglas, smiling. So what did Arkin think of his co-star? "I expected you were going to be more rigid," he told Douglas, sitting with him in a hotel restaurant booth. "But working with him from day one, I just found him incredibly flexible and a little shy, interestingly." Douglas replies in kind. "I was a little in awe of him as an actor," he said, then was interrupted. "Get the hell out of here," Arkin said. Douglas smoothly carried on. He lauded his co-star's "great sense" of comedy, which earned him an Oscar for "Little Miss Sunshine," and the chance to study his impeccable timing. Their series debuts Friday on the streaming service. Exercising his comedy muscles was one reason Douglas signed on for his first small-screen series since "The Streets of San Francisco" police drama made him a TV star in the 1970s. He went on to become an Oscar-winning movie actor ("Wall Street") and producer ("One Flew Over the Cuckoo's Nest"). That sitcom hitmaker Chuck Lorre ("The Big Bang Theory," ''Mom") was stretching creatively with "The Kominsky Method" was another draw for Douglas. Creator-producer Lorre took full advantage of being freed from network commercial breaks and a rigid half-hour format, Douglas said, and he upped the ante on heartbreak. "It was a freedom for him at this point in his extremely successful career that he really enjoyed," Douglas said. Douglas plays Sandy Kominsky, who had a middling career as an actor but is lionized as a coach by young students at his modest school. Arkin is his gruff but patient (to a point) agent and friend, Norman Newlander. Norman is married to cancer-stricken Eileen (Susan Sullivan), Sandy is divorced and not averse to taking up with an age-appropriate student (Nancy Travis) — but only after he announces to the class, in proper #MeToo fashion, that she asked him out. Sandy has a daughter, Mindy (charming standout Sarah Baker) who's supportive despite his past failings as a parent, while Norman's relationship with his offspring, Phoebe (Lisa Edelstein), is difficult. Guest stars in the eight-episode series will include Danny DeVito, Ann-Margret, Jay Leno and Patti LaBelle. The jokes skew generational, sparing neither young or old. Sandy targets fledgling actors dedicated to fame and oversharing, while he and Norman commiserate about aging and its toll, such as the fallout from an enlarged prostate. "I urinate in Morse code — dots and dashes," Norman says. Lorre's "magic" is to make getting older funny, in contrast to its usual depiction as depressing or something to be caricatured, said Douglas. Identifying the worst part of aging is easy, said Lorre, 66. "Your body's falling apart. It simply doesn't care that there's things to do and places to be, and you're caught inside this meat costume," he said. "You catch a glimpse in the mirror and go, 'Sweet Jesus,' who is that old guy?'" His resume allows him to find laughs in such "cognitive dissonance," Lorre said, but he wanted to go deeper in "Kominsky." Thus the poignant elements such as Norman and Eileen's enduring affection, "the kind of a love affair which you don't necessarily see in Hollywood" very often, he said. To observe Douglas, 74, and Arkin, 84, grab hold of the material was both an "education and its own form of entertainment," Lorre said. "You're sitting there watching actors of this caliber take your words and make them far better than you could possibly imagined." While both actors work steadily, Douglas said it's impossible to ignore how age affects the nature of that work. "There's a reason all of a sudden you are getting cast for these parts, whatever image you have of yourself. When you're looking in the mirror, yes, you look pretty good for your age, yeah, yeah — but..." he said. "I'm just so happy that we're in an occupation that allows us at our respective ages to continue on at something we love." "I wouldn't know about retirement," Douglas said. "This is wonderful, wonderful work."